Check out this semi-hollow piece for the acclaimed bassist. 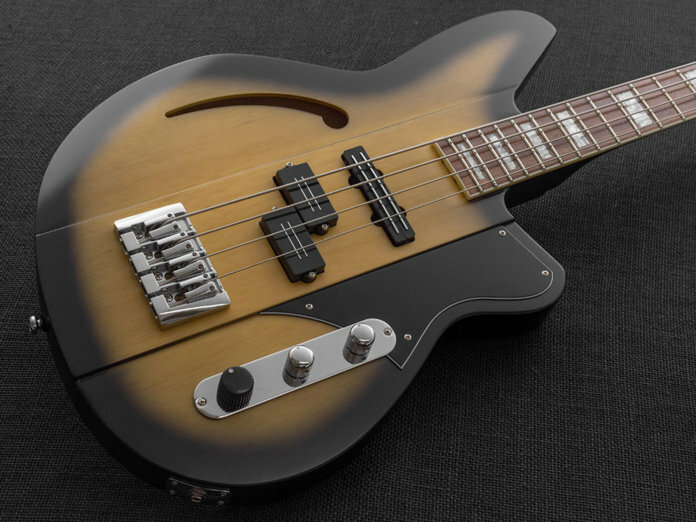 The Basshouser Fatfish 32 is Houser’s second Reverend signature bass. It features a semi-hollow construction, a maple back for clarity and punch, as well as a raised center ridge that contributes to a resonant midrange. As for electronics, the four-string is loaded with a P-Blade pickup at the bridge and a brand-new Jazz Bomb pickup at the neck that’s touted as hum-free. The former is voiced for a tight and snarling tone, while the latter features steel rails that contribute to a rich and focused output. Rounding out the bass’s look is a stylish reverse headstock and neat block inlays adorning the pau ferro fretboard. Available in Midnight Black and Korina Burst finishes. Lists at $1,679. This bass is built for versatility, with its trio of Jazz Bomb pickups and a five-way pup switch. Needless to say, you’ll be able to come up with a wide range of tones from this configuration. The Triad comes decked out in a variety of finishes and fretboard options. It’s available in a Metallic Alpine or Burnt Brick finish that’s complemented by a roasted maple fretboard and funky black block inlays. The Purple Burst version, on the other hand, features a pau ferro fretboard adorned with pearloid block inlays. This four-string is described as a veritable “slap machine”. Its tone is derived from a Thick Brick bridge pickup and the new Jazz Bomb neck pickup. The former’s open, wide tone blends with the latter’s focused tone for a unique percussive character. Available in Venetian Gold, Chronic Blue, and Midnight Black finishes. Lists for $1,199. This model has been updated with a new pickup configuration: a P-Blade at the bridge and a Jazz Bomb at the neck, similar to the Basshouser Fatfish 32. Available in Burnt Brick, Chronic Blue, and Oceanside Green finishes. Lists at $1,199. As on all of Reverend’s bass models, each of these guitars features a Boneite nut, five-piece neck and Hipshot Ultralight tuners. They also have a lockdown bridge and six-bolt neck plate for added sustain.